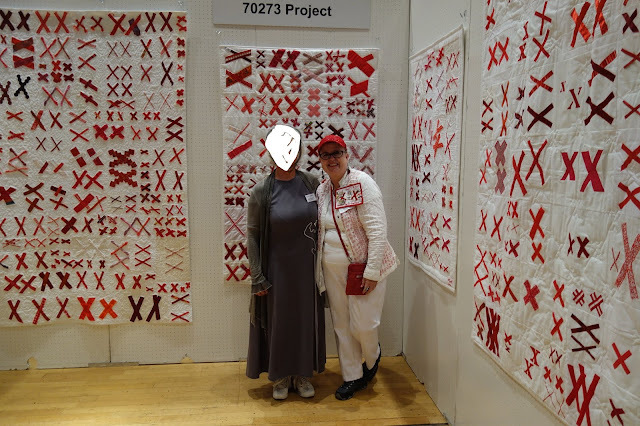 I was gone for 2 weeks, paid first a visit to relatives in Northwest Germany before I continued to Celle for work at the biggest quilt show in Germany. Each year the German Patchwork Guild has been organizing such a show which runs for 2 days. As always the exhibition was wonderful, had nearly 1500 visitors and I met some interesting people. Ich machte die nette Bekanntschaft mit Jeanne Chadwell und ihrem Ehemann, die aus Atlanta gekommen waren. Jeanne ist die Gründerin des Projektes 70,273. I met Jeanne Chadwell and her husband who came from Atlanta. Jeanne is the founder of Project 70, 273. Quilters from many European countries worked on this projects. Das ist die noch unfertige Arbeit meiner Gruppe ,den Alpinen Quilter. Sobald sie fertig ist, wird sie an die Sammelstelle geschickt, - This is the unfinished work of my group, the Alpine Quilters. After completion it will be sent to the US. Meine Gemeinschaftsarbeit mit Sandra "das Dreieck im Quadrat" war ein Erfolg. - My joint project with Sandra " Triangle in a Square" was a nice success. I met Denise Labadie from Boulder /Colorado. Once on a trip through Irland she has been so fascinated by the the country's rock formation that this became her main subject for her work. Ich hatte das Vergnügen, Claudia Pfeil kennen zu lernen. Sie ist so spritzig und funkelnd wie ihre Quilts, in die sie kleine Swarowski Steine einarbeitet. Der größte hat 55 Tausend Glitzersteine, die man leider mit der Kamera nicht richtig sichtbar machen kann. - I had the pleasure to meet Claudia Pfeil, a German quilter who is known for her sparkling quilts. She uses big amounts of tiny Swarowsky glass beads, sometimes as many as 55 thousand in a large quilt. Unfortunately it is hard to catch this in a photo. So das wär's für heute, mehr kann ich leider nicht zeigen.